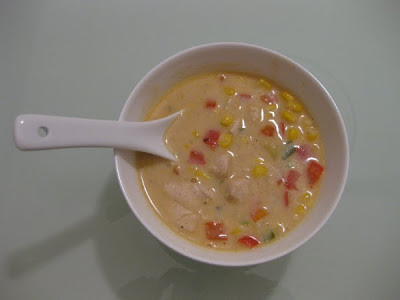 My chicken corn chowder is an adjusted version of this recipe. Instead of Worcestershire sauce and hot sauce, I used cumin, paprika, and cayenne pepper to add spicy flavour. I also added corn starch to thicken the broth. It didn't taste too bad! Ohhhhh, love the addition of paprika. I bet it's delish! Darn! I can't eat spicy. But your chowder looks very good - creamy and yummy. Yum! I love chowders! I'm so trying this tomorrow night! i'm currently in china for work and your corn chowder is making me hate chinese food and crave chowder! Om nom nom nom, looks yummy! Awesome recipe. Must try this out as well... I've been meaning to incorporate more soups into the culinary routine!